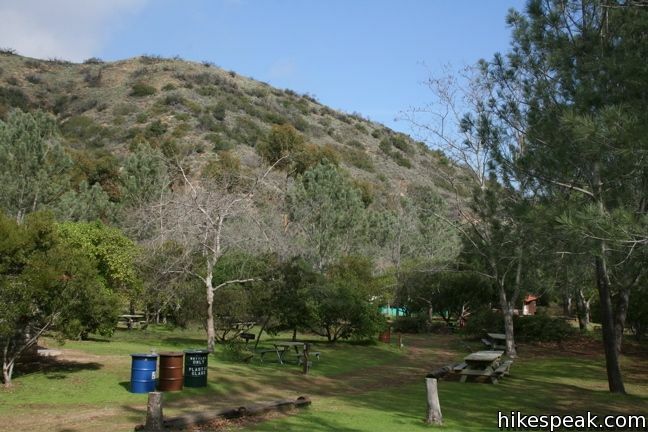 The only campground in the city of Avalon on Catalina Island is Hermit Gulch. 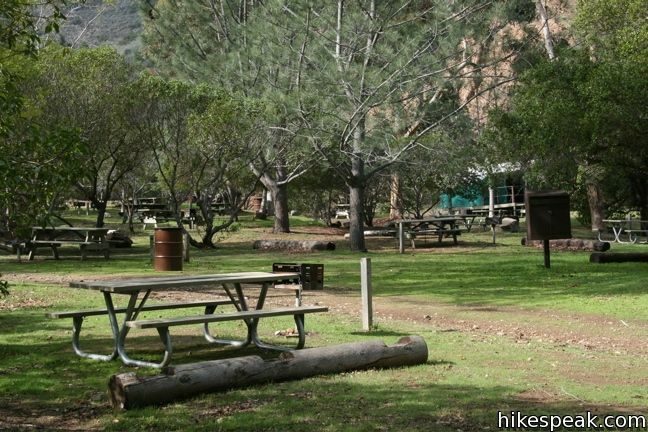 The campground is located a mile from the center of town on Avalon Canyon Road just before the Botanical Gardens. For hikers, the adjacent Hermit Gulch Trail provides a single-track ascent to the Trans-Catalina Trail on the ridgeline above Avalon. 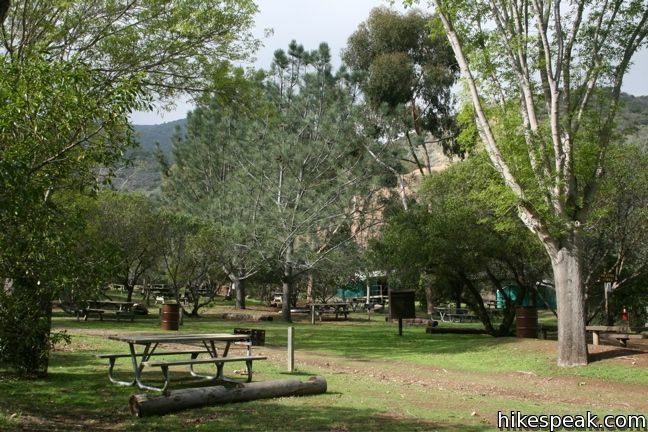 The campground is made up of 43 sites, each with its own picnic table. Charcoal, propane, and ice can be purchased from the campground host (wood fires are not permitted). Flush toilets and coin-operated showers are provided. Hermit Gulch charges per camper (and not per camp site). The price is $25 to $28 per person for adults and $16 to $19 per child. Hermit Gulch has several sites with platform tents in place for those who would rather not lug tents out to the island. These tents may be reserved for $60 – $80 per night (prices fluctuate for seasons and holidays). The campground enforces a 2-night minimum on weekends and a 3-night minimum on holidays. Stoves, sleeping bags, and tents can also be rented for a fee. See the Hermit Gulch Campground webpage to determine the cost of your visit. Reservations are required. To make one call (310) 510-8368. From the ferry launch in Avalon Harbor to the campground is a 1.5-mile walk over level paved roads. Taxis and shuttles are also available. For other lodging options and activities in Avalon, visit tripadvisor.com. To get to the campground: Take a ferry 22-miles across the Pacific to the city of Avalon on Catalina Island. Walk through town and up Avalon Canyon Road. Hermit Gulch Campground is on the right side of the road after one mile. These photos were taken in January of 2010. Click to enlarge. This 11.75-mile hike over the ridges above Avalon offers amazing ocean views, in two directions at times, as well as a look at the pristine interior of the island. My little sisters are graduating from high school and we were thinking about taking them camping at Hermit Gulch. There maybe 8 of us coming all of the family. Please give me a quote for two nights and three days at the end of July. Do you know at what time checkout from this campground is? And I’ve read several places that no wood fires are allowed, but others say the rangers sell wood. So what is it? There are grill stands, but I do not believe there are any fire rings. Your best bet is to give the campground a call to confirm and made a reservation at 310-510-8368. Have a great trip! Hi, we were wondering if we could set up 2 tents on one camp site. Or, since they charge per person anyway, should we make 2 reservations? I see that we should try to get there early in order to get 2 sites next to each other. Thanks for any help you can give. Hey I just had a question. Are there permits for hiking thru up and down Catalina for backpacking? 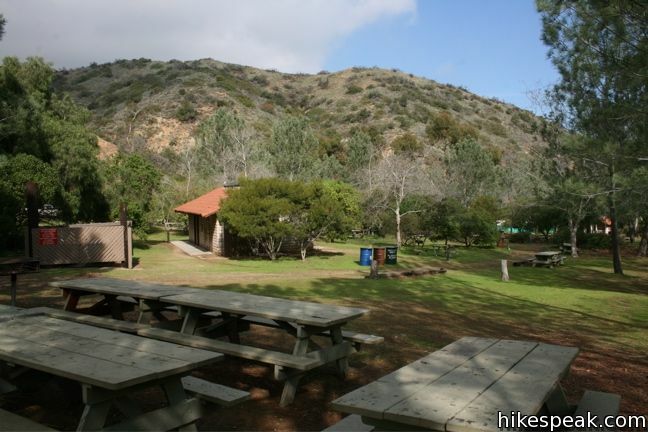 You will need a permit from the Catalina Island Conservancy along with camping arrangements. Hi! I was wondering if anyone knew if Mamrie Hart and Grace helbig went there for Hey USA season 1 for the last episode in LA and Catalina. Here is the link, and if you have ever gone to hermit Gulch, please tell me if thats where they went. It would be so helpful.